Classes are in fact "special functions", and just as you can define function expressions and function declarations, the class syntax has two components: class expressions and class declarations. we will discuss all one by one. NOTE: When the object is initialized, the constructor method is called, with any parameters passed. In this example we have created getName function inside the employee class, this getName function fetch employee name. 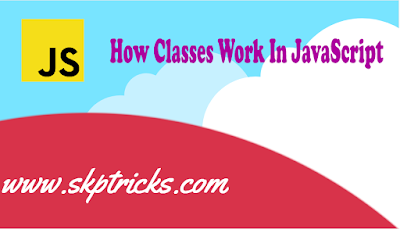 Job Type is :- IT"
We can also assign methods to the class function, not to its "prototype". Such methods are called static. Also you can create class structure using function as well. lets check out below example, where we have invoked a function with the new keyword it will return the empty object.